Cloisonné Enamel Jewelry in 18k Gold with three 2-2.5mm sapphires. As an artist I create cloisonné enamel jewelry and study our worlds natural beauty. Our waste and over-consumerism impacts me profoundly. Therefore, I am committed to create a quality jewel, enamel jewelry that lasts, that is timeless. I execute my art to be one-of-a-kind, that become cherished family heirlooms, and speak to permanence, striking natural beauty and using adornment to set oneself apart. 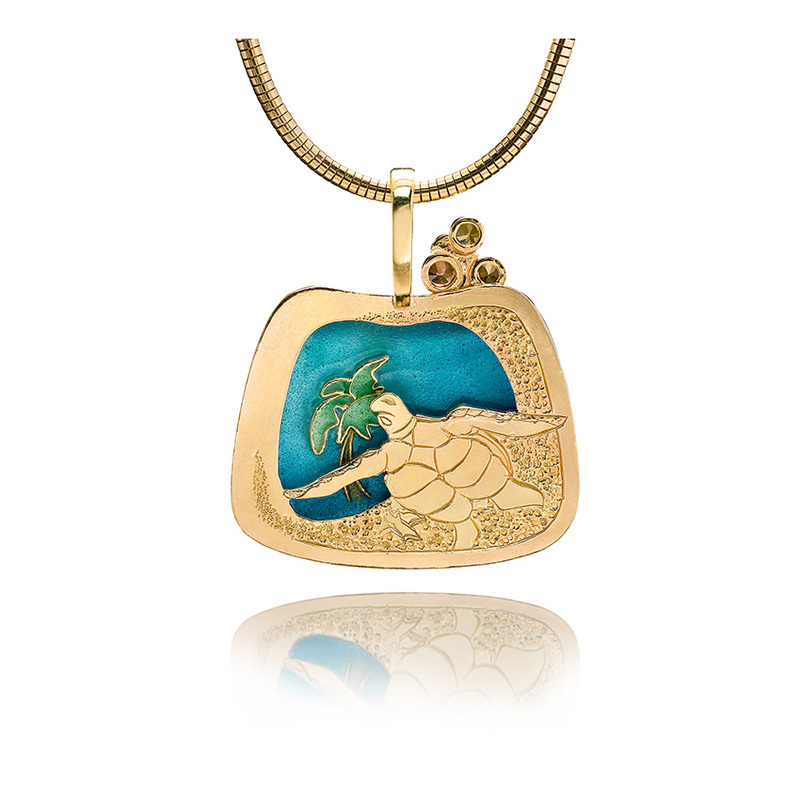 This cloisonné fish necklace is a memory of the Hawaiian reefs I was so fortunate to visit while living a few blocks from the ocean. With a couple of girl friends we would meet up several times a week and swim off shore. During the times of the year when the ocean swells were not huge of course. 6 years of living in such a magical place will always be vivid in my mind. As each journey into this wonderland we saw something we had never seen before. Enameling on metal is much like painting on a canvas. With this small art form I am painting for individuals that see our plant as a unique gift. We ornament ourselves to express our inter thoughts. Ones personality, emotions, beliefs or statue in life, are represented in these small art forms of cloisonné jewelry. 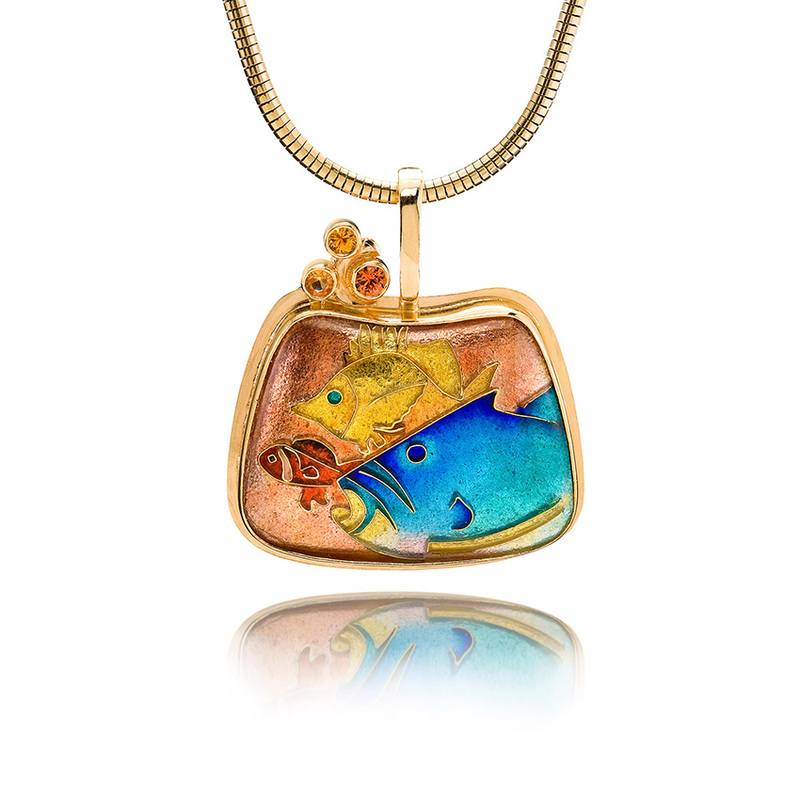 Big Fish Little Fish is a cloisonne jewelry piece created by Patsy Croft. It belongs to a collection of amazing enamel jewelry with unique jewelry designs.